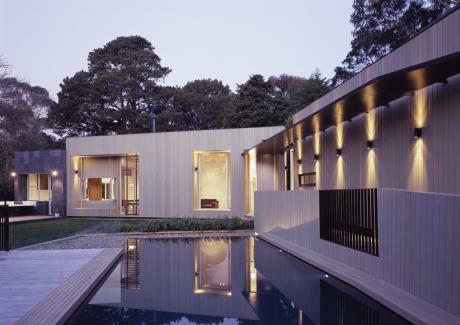 The house is sited around two major trees, one of which is a striking park-scale blue gum. This tree forms a fulcrum around which the house pivots. The house is divided into 2 wings: the main body of the house and the studio/summer house. Instead of being ‘out the back’ the studio wing forms the entry journey. Access to the front door is via an enclosed path formed by this building, past the pool and out onto a deck where the full view of the blue gum and the main house are revealed.